Wondering If a Rifle Scope Brand Is Worthwhile? Start here. Rifle scopes are normally used to influence long-distance shooting as they allow you to see distantly place objects closer to you. A wide range of rifle scopes are available in the market and The Gun Source is no exception. You can find rifle scopes of most of the famous brands at The Gun Source. Some of these popular rifle scopes are briefly reviewed here under for your consideration. Bushnell is an established brand in the imaging and optics industry of America. They are also known in the world of firearms for the AR-15 rifle scopes they have introduced including Optics Drop Zone-223. This rifle scope is the best for the novice shooters as it is easy to use as well as affordable in price. It has been specially designed for 5.56 NATO and .223 Remington cartridges ranging from 55 to 62 grains. Its standard objective lens is 40 mm and its magnification power is 3-9 times, which makes it great for long distance target shooting in open fields. UTG is another popular brand that offers rifle scopes for AR-15 at affordable prices. The company is known for producing top quality rifle scopes build from high-quality materials but sell them at very reasonable prices. Bug Buster can be the right rifle scope for you if you are searching for a device within your budget. This versatile rifle scope can be used in different situations. It is made of a 9.8-inch long 1-inch tube weighing nearly 14 ounces. It is coated with emerald to maximize the transmission of light. It is provided with two flip-open lens caps, two heavy duty mounting rings and a 2-inch sunshade. In this way, you can consider it as a high-class rifle scope due to its strategic profile. This rifle scope can be the best option for you if you are looking for an affordable device to fit in your tight budget. Though it is a low priced scope but Simmons has not compromised in its quality. It can be a good scope for new shooters as it costs even less than $100. Simmons has used a large objective lens with 50 mm focal length in 8-Point Rifle Scope which is normally not suggested for the professional shooters. The beginners are recommended to use standard scopes with 40 mm lens. This scope provides to-the-point clarity to the image with the help of the light transmitted by its large objective lens. However, it can affect the accuracy of the novice shooters as it sits farther from the barrel of the gun. The range of magnification of this rifle scope is from 3-9 times which makes it the best scope for long to medium and short distance shooting. Its weight is nearly 10 ounces and length 15.3 inches and it acquires its targets easily with the help of the accessories provided with it. Thus, you can find various types of rifle scopes manufactured by various popular brands at The Gun Source. You can also contact them to know more about rifle scopes of your choice. Either way, there is a lot to be considered when picking out your new scope, and here at The Gun Source we want to make sure you are getting your moneys worth. The rapid rise of popularity of long-range shooters and snipers among common people is because of the attraction of the scopes that has never been experienced in the past. Whether it is for hunting, shooting or for the tactical purpose you choose it, you will enjoy a lot when you use the ideal type of rifle scope. We will discuss here different types of rifle scopes/optics including those used in snipers, hunting rifles and tactical guns. Rifle scopes are of various types and can be used for a variety of objectives. There are some objectives where it benefits from some of the specific attributes of a rifle scope. We will discuss here certain types of scopes are dependent on the purpose are the objective. 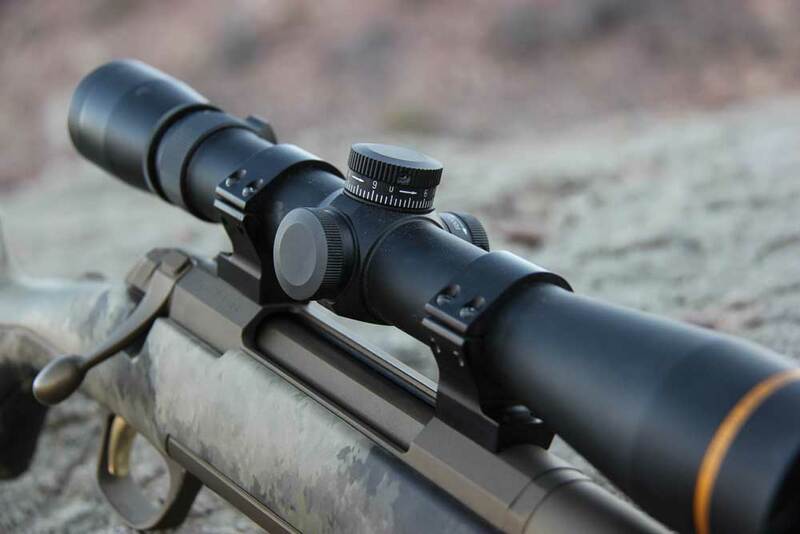 Hunting scopes have a simple structure with a small number of standard features. An ideal hunting rifle scope should be user-friendly and should enable spend time without affecting the quality of the job during hunting without the performance getting vitiated by obstacles such as trees and other structures. Hunting scopes with a power less than 20 are the more commonly used than other scopes. They have a plain reticle. They may be of variable power are fixed power. However, they a bigger objective lens. This allows more amount of light resulting in a clear and bright view. A scope having more than 20 power is considered excessive. Hunters are obsessive to choose scopes with a similar power of an armed forces rifle scope that is close to 8 to 10 power. They do not have any adjustment except those used for seeing in the scope in the beginning. An ideal tactical rifle scope is equipment for a specific purpose notwithstanding everything is made associated with it to promote sales. In other words, a 4X rifle scope with an objective lens of large size may look better. However, it does not possess a tactical rifle scope. At tactical scope has a lower magnification power. It may be as small as 4X and it can be used to increase the engagement range from open sights that are effective. In such a case, it plays a designated marksman’s role in the United States armed forces and not as a sniper. A tactical rifle scope enables to take a range from standard 300m to close to 600 m (normal infantry rifle range) by using a low magnification without limiting the close range capacity. This is the thumb rule for choosing a tactical rifle scope. This is the extended range of scores that are widely used in armed forces. However, the scope is described by the job it performs. Yet, these scopes aren’t high power ones that many people are obsessed with. The US armed forces use snipers with scopes of a fixed power of 10 and equipped with a mil-dot reticle and turrets for fine adjustment. These have been found very effective over more than 70 years. To use this sniper scope, you need to undergo long training consistently to achieve long-range shots. If you are planning to ape armed forces sniper rifle as part your collection, low powered optics are the best option thanks to the reasonable quality. These are simple and easy guidelines to choose a rifle scope that you can use for various objectives – hunting, shooting, and the like. As you gain experience you can yourself decide if your option was right at the beginning.